C050055H001A is a connectorized END. External, Dual Polarized Antenna not included. Coaxial Cables not included. 2 required to create a LINK. 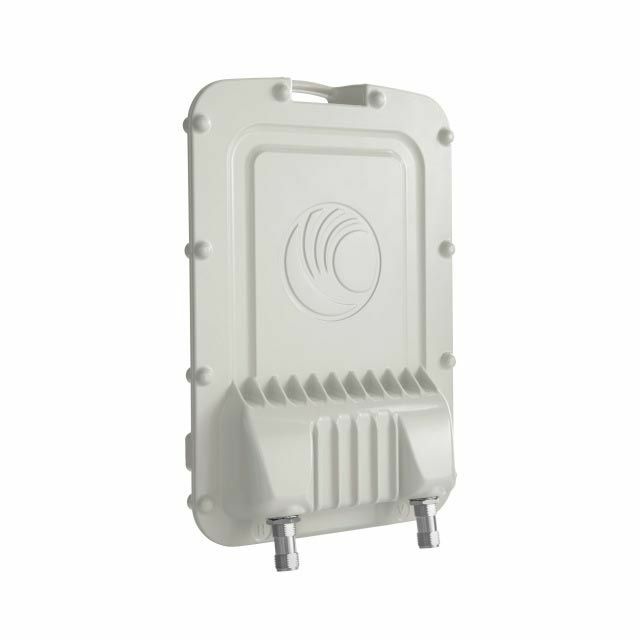 The PTP 550 is a Point to Point Gigabit wireless backhaul with high throughput based on 802.11ac Wave 2 frequency. They operate in the 5 GHz wireless space, addressing the gigabit capacity needs for high speed backhaul solutions in short range and middle range applications. The high throughput of almost 1.4 Gbps is acheived by using a channel bonding feature. When combining dual 80MHz channels, the 1.4 Gbps is possible. Each PTP 550 radio is enclosed in a rugged IP66/67 rated metal enclosure, which protects the radio from extreme conditions and solar radiation. With a small footprint of 12" x 12", this antenna can be placed almost anywhere. If mounting onto a pole, or mast, it is very lightweight, (5 lbs Integrated, 4 lbs connectorized) The antennas in the PTP 550 series are IP66 and IP67 rated for outdoor use. This PTP 550 has a latency of only 1-3 milliseconds one direction, and will support dual independent channels, each channel configurable in 20, 40 and 80 MHz width. A great feature for this series radio is that they support dynamic channel selection (DCS). This means that when enabled, the radios will automatically select the best channel for use. They will scan constantly to check for interference, and will change to avoid interference. The result is the best available throughput with limited spectrum even in the most challenging environments.